After one of the school Masses, a parent came up and asked me to stop talking about how bad I was at math—she thought I might scare the hardworking students and encourage the lazy ones! But there’s no getting away from it. I was truly terrible at math, and in my last year of high school I passed only by promising I would never study it again. The course was called “Terminal Math.” Not a cheery name. I don’t want to make excuses, but part of the problem was that math wasn’t very well taught. In most classes I felt that I was left to sink or swim. I sank. But not in geometry. There I had a teacher who taught, and I remember one lesson very clearly after forty years. Mr. Ferlinghetti took a kid’s construction set—plastic girders, with nuts and bolts, and made a square. Then he pressed on the corners and it collapsed. Then he took one of the girders away and made a triangle. No matter how hard he pressed, it held its shape. Today, I would like to make a triangle that will teach us a more important lesson: a triangle with Jesus at the top, with Saints Peter and Paul at the other points. This triangle can help us understand the Church and how God keeps it strong. It can help us to put up with things—and people—we find difficult in the Church and even in the parish. That Jesus is key, the high point and even the center—if triangles have centers!—almost goes without saying. He is, of course, the beginning and the end, the Alpha and the Omega, and the head of the Body that is the Church. But what of Peter and Paul? Why are they so important to the Church, past and present? Let’s just look at three reasons. First, as we’ll hear in the Preface for today’s Mass, “each in a different way gathered together the one family of Christ.” Peter carried on the mission of Jesus to the Chosen People, while Paul is called the teacher of the Gentiles because he preached the Gospel to the Gentiles, to the non-Jewish cultures of the ancient world. What a reminder that each of us has a unique call in God’s plan, be it great or small! There can’t be one way of building the kingdom, one path for everyone. And sometimes our callings may even collide. At the beginning, Peter and Paul seemed to be at cross purposes, and there was tension as a result. But through God’s grace and mutual charity, the apparent conflict was resolved and their two missions continued in peace, side by side. Peter and Paul are important precisely because they were different—not only in their mission, as I’ve just said, but in their personalities. A second reason to be joyful this morning is the diversity within the Church that these two represent. 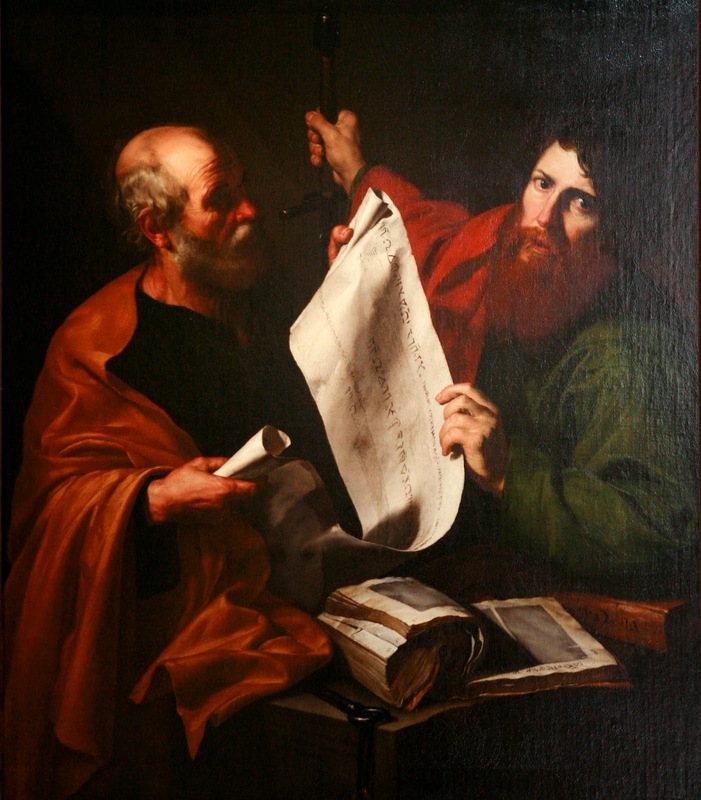 The writer goes on to say that St. Peter represents the institutional side of the Church — the side that sets rules, governs dioceses and attends to the doctrines and norms of the Church—while St. Paul is the prime example of the missionary Church — the Church that goes out and adapts itself to different cultures, proclaiming the Good News. “Of course, St. Peter also goes out, as today’s first reading about his imprisonment demonstrates. And of course St. Paul also sets rules for the Church,” as we often hear when his letters are the second readings at Sunday Mass. And judging by their letters, the natural temperaments of the two saints were quite different. Peter’s weakness was foot-in-mouth disease, while Paul’s was a bit of a temper. One thought simply, the other in a more complicated way. Their unique personalities, good points and bad, were both used by God for his purposes. Whenever we are tempted to a one-sided view of the Church, we have Peter and Paul standing before us. I am sure that Pope Francis wanted to celebrate the diverse gifts in the Church by canonizing St. John Paul and St. John XXIII in the same ceremony. If Francis is ever canonized, perhaps it will be along with Paul VI or Pius XII for the same reason. Whether we are looking at the Church universal, or Christ the Redeemer Parish, we realize today that “it takes all kinds.” There’s no single model for saints, popes, pastors or parishioners, but rather a marvellous diversity—as St. Paul himself explains with the image of the Body of Christ. A third and final reason to be joyful this morning is that the faith of Peter and Paul has become a lasting gift from Christ to the Church—and to us today. When Peter says to Jesus “You are the Christ, the Son of the living God,” he is professing not just his own belief but the word the Father has given him to speak. Peter’s faith is a gift from God, given as the bedrock on which the Church will first be built and then prevail until the end of time. Jesus makes it perfectly clear in today’s Gospel that the faith of the Church comes not from man but from God. Paul’s faith, recorded in the intensely personal letters he wrote to Christian communities and to his closest collaborators, are part of the written Word of God—divinely inspired scriptures that develop the teaching of Jesus under the inspiration of the Holy Spirit. All this assures us that our faith, the faith of the Church, rests not on human testimony but on divine revelation. On such a rock we are secure from passing fads, modern errors, and fruitless doubts. The faith—and faithfulness—of Sts. Peter and Paul also challenge us to depend on God despite our own sinfulness. We’re so familiar with these apostles that we may forget that one was a traitor to Christ and the other a persecutor of Christ. How can we let ourselves be held back by our past failings when God’s grace and power can raise wounded men to the heights of holiness? The example of Peter and Paul reminds us to let go of our past and trust God for our future. Most of all, these great pillars of the Church are two points on a triangle that has Christ as its apex. They point us to Christ in our weakness, and remind us that Christ is our strength, just as he was theirs.